Peacock bass are a group of tropical species of bass native to South America, specifically the Amazon River basin. Despite its name they are technically part of the cichlid family as opposed to bass. 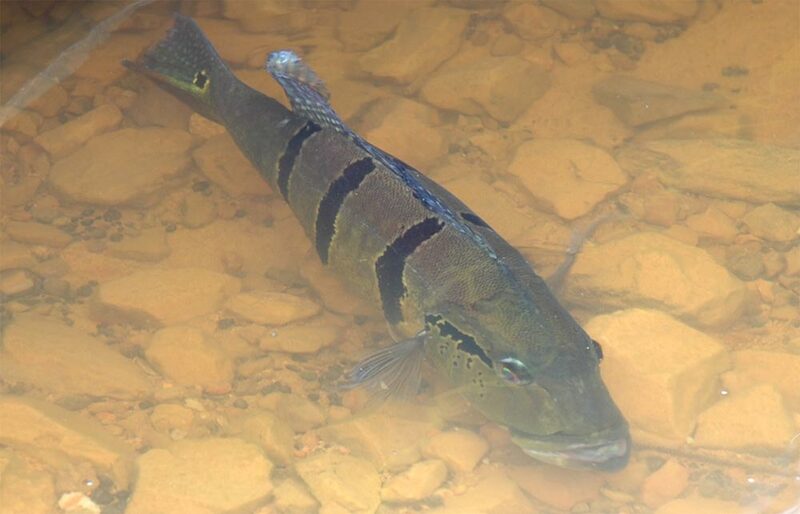 There are over a dozen species of peacock bass, but this section will look more closely at the butterfly peacock, introduced to Florida and thriving as a non-native species. Notice the black spot on the back of its tail. The color of the fish varies, but often the butterfly peacock bass is golden with three vertical black bars that fade with age. A distinguished black spot with a yellow outline is present on the tail fin. The body shape resembles a largemouth bass. Males get a hump on their forehead during spawning times. Up to 12 pounds (5.4 kg). Fast, reaching over a foot (30 cm) in in the first year-and-a-half.After that, the fish begins to pick up a lot of its weight. Native to the Amazon River. Introduced into Florida in 1984 (flourishing in Miami-Dade and Broward counties). Slow-moving canals, ponds, and lakes. Butterfly peacocks enjoy shady areas with lots of cover. Almost exclusively on fish, especially the spotted tilapia and Midas cichlid. Spawning season runs from April to September. Females lay between 4,000 to 10,000 eggs. Information credit: Florida Fish and Wildlife Conservation Commission. What Type of Gear do you Need for Peacock Bass Fishing? 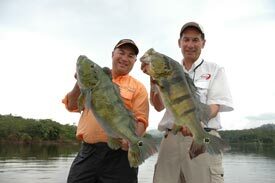 Bob and Wayne Izumi hold up two monster peacock bass. A key required element for peacock fishing is having a reel with a fast retrieve. Without one, you won't have the necessary speed needed for the action on your lure. Spinning reels are a popular choice for that reason. They are also good for small to medium-sized jerkbait and spoon presentations. Baitcast reels are better for larger topwater plugs, so long as they have a gear ratio of at least 6.3:1. A slow retrieve not only limits the effect of certain lures, you will get more tired having to put in more work for the same results. A medium/heavy to heavy rod is perfect for peacock bass, with a length no greater than 7 feet (6'6" is ideal). You can get away with a medium, or even a medium/light rod, but only when fishing smaller-sized lures for smaller-sized fish. Braided line is an absolute must for peacock bass. The abrasion resistance and the no-stretch make-up of braid far outstrips any advantage monofilament may have. Something at least 50 or 65 pound test is required. If you simply have to use mono line, make sure it's at least 20 pound test line. This is not to say smaller line will not work - indeed, it is very possible to catch peacock bass with nothing more than 6 lb test on a light action rod. The problem is you'll only be landing smaller fish and you'll be spending more time dealing with line breakage than actually fishing. 4-8" jerkbaits, bucktail jigs, lipless crankbaits, and topwater plugs will get you the best results. Spoons are also effective at times. In a lot of ways, lures that work for largemouth will work for peacocks as well, so long as they're fish-like in appearance (plastic worm would not worsk so well). Be sure you keep an eye on your hooks as extended use will eventually bend or even crush hooks, especially if they are not heavy duty. Live bait is also useful. When do you Fish for Peacock Bass? Peacock bass fishing is at its best in the pre-spawn stage, especially the month prior. At this time these fish have voracious appetites and baitfish are in abundance. During the spawn and the weeks afterward, peacocks are not such great targets, though because they are so territorial, you can get some reactionary bites. Fishing picks up again a month or two after the spawn. Peacock bass are daytime feeders, rarely coming out at night for a meal. Targeting shady areas in the middle of the of even the hottest day will get you results. 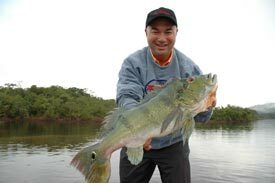 Bob Izumi with peacock bass. Peacock bass are a schooling fish, so if you come across one, there's bound to be others. The problem is that sometimes all the commotion of catching one may scare off the rest of the fish. One way to combat this unfortunate occurrence is when you do have a fish on, have a fellow angler cast near your fish as you reel in. Often a butterfly peacock or two will follow along and may strike as well. Do not give up if a bass strikes but fails to catch on. Peacock bass will strike again - and again and again - so long as you maintain your retrieve. This is especially so for topwater lures. 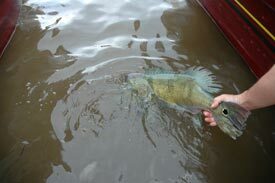 If the fish does not strike again, quickly change to a subsurface lure like a crankbait and it will likely strike again. Furthermore, as violent as a strike may appear, it is critical you do not set the hook to quickly. Patience is a must for these fish often strike not to bite but to stun, so be prepared for that second hit. Casting is certainly the most popular method to catching these fish, but trolling is an effective method as well, especially in open and clear water. Use a 4-5 inch heavy body spoon for best results - the trusty five of diamonds pattern can work for peacock bass as well. Hold on tight! A peacock bass can strike hard, fast, and out of nowhere, so be sure you've got a good grip on your rod. When fishing around heavy structure, you have to keep an eye on where that peacock bass is swimming towards. Keep your catch away from structure with a sideways angle to avoid line breakage.